Practicing analog time to the half hour, quarter hour or 5-minute increments is fun when you can collect animal cards. Students (2-4) move around one of the three game boards, reading the time on the clocks and looking to see if that time matches the feeding time for one of the animals. If so, the player can feed the animals (collect the cards). 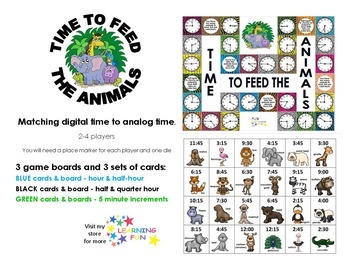 The first player to feed 6 animals wins the game, but you'll win too because your students will want to play thiss game again and again! If you like this product, please provide feedback and consider following my store so you don't miss future freebies.